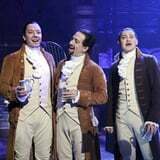 Raise a glass to Lin-Manuel Miranda and The Tonight Show Starring Jimmy Fallon! On Jan. 15, the late-night host released videos from his visit to Puerto Rico, which included a full-costume performance with Miranda and the Hamilton cast. In a clever twist, Fallon sang "The Story of Tonight" with updated lyrics, giving a nod to his own show. "There are friends who say 'good luck,' and there are friends who say, 'Hold on, I'm coming with you,'" Miranda tweeted, in regard to Fallon's support.